The world's paramount astronomical authority on Tuesday slapped down a bid to hawk the names of Mars' craters, saying the Red Planet's monickers are not up for sale. "Such initiatives go against the spirit of free and equal access to space, as well as against internationally recognised standards," the Paris-based International Astronomical Union (IAU) said in a press release. "Hence no purchased names can ever be used on official maps and globes." IAU spokesman Lars Lindberg Christensen told AFP the move came after US crowdsourcing website Uwingu (www.uwingu.com) said the public could name craters on its map of Mars for a fee. Founded in 1919, the IAU holds the official mission of naming all planets, satellites, comets and asteroids in the Solar System. The topographical features of Mars, named after the Roman god of war, for instance, carry Latin names like "mons" for mountain and "planitia" for plain. In half a century, the union has named only a thousand of the estimated half-a-million craters on Mars—each decided in a cautious vetting process. 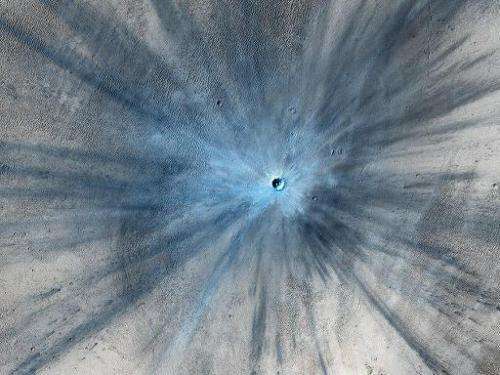 Large craters wider than 60 kilometres (37.5 miles) have been named after deceased scientists, explorers and writers who have added to Martian lore. Smaller ones carry the names of Earthly cities with populations of fewer than 100,000. Uwingu said the money generated through its scheme, launched two weeks ago, will be used as "grants for space researchers, educators, and entrepreneurs in this time of government cutbacks". Prices range from $5 to (3.6 euros) to $5,000, depending on the size of the crater, and the website lists a $10-million goal for 2014. Those who purchase a name will have it listed on Uwingu's database, which also includes monickers already given by the IAU. The purchase only gives rights to the entry in the database, not to the crater itself. "Once you've completed the checkout process, your name is accepted," says the website. "And unless it's later found to be profane, pejorative, or otherwise offensive (in which case it'll be removed), it'll remain approved." In an article posted Monday on the specialist website The Space Review, Uwingu's founders—planetary scientists Alan Stern and Mark Sykes—said 7,000 craters had been named by people in 78 countries in 10 days. The IAU said the public can get involved in naming when a space agency or the discoverer of a new feature or object asks for ideas. "This was the case for NASA's Magellan Venus mapping mission launched in 1989: the public was invited to offer names of women who had made outstanding or fundamental contributions to their fields, for the names of Venusian craters," it said. "A more recent example was the naming of the two most recently discovered satellites of Pluto in 2013, which was the result of a public vote." The moons were named after a many-headed guard dog, Kerberos, and an underworld goddess, Styx, in Greek mythology. What is an "official" map and globe? I wonder how much of the "grant" money goes to Stern et al? He seems to sponsor these "fund raisers" every other year or so. I wonder if he ever gave Laurel that grant he promised her for her Pluto crusade? How does it go against free and equal ACCESS to space? It's just naming things. It doesn't stop government run egalitarian (?!) space travel in the future to these places.